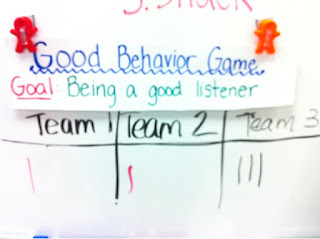 The Good Behavior Game - Hippo Hooray for Second Grade! The poster hangs next to my SMARTBoard in the front of the room and has gone unnoticed over the past few weeks. 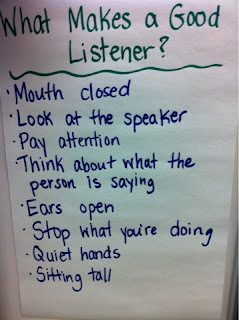 Not only does this sum up many of things we needed to work on, but "Good Listener" had already been defined. Now I don't need to spend time brainstorming and explaining what I was looking for. AWESOME! Next you divide the class into two teams: Team 1 and Team 2. I just split the desks down the middle. Then it's time to play! Basically any time you see a person not doing the behavior goal, their team gets a point. The team with the fewest point by the end of the lesson gets a prize. I'll talk more about the prizes I've been using later in this post. When you catch someone not doing the goal, you're actually supposed to call them out on it. "Oops, Johnny. 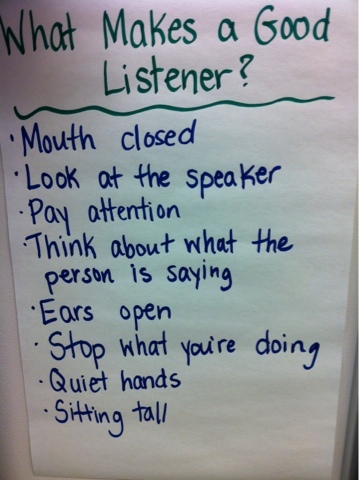 Good listeners are not chatting with their neighbor." (Teacher adds tally mark to Johnny's teams) At first I felt really terrible for singling the offenders out, but how else are you supposed to let them know that what they're doing is not OK? You can't just add tally marks to the team's score without saying anything, or else the team won't know how the points got there. I think as long as you have an "oops, sorry" approach and don't go on and on and on about the offense, you shouldn't worry too much about hurting someone's feelings. You know who your super-sensitive kids are and which ones can accept the constructive criticism in front of their peers. After explaining the directions, we first tried it during math. Team 1 did pretty well. They only got 4 points. Team 2? Yeah.... 11 points. Yikes. Everyone on Team 1 got a prize. We started over when we switched to Social Studies. This time, Team 1 got one point and Team 2 got three points. YEAH!! I was proud of Team 2 for getting it together, so everyone got the prize. We also played the game in the afternoon during Writer's Workshop. I don't remember the score, but I do remember that Team 1 won. Of course you'll have a few kinks. I did have one instance where one student went too far, and was being pretty mean to another who had earned a point for the team. I pulled that student aside and said that sometimes people make bad choices, and that he needs to do HIS job; not worry about what others are doing. That team ended up being the winning team, and I gave everyone a gotcha, except for my friend who was being mean to his teammate. Sorry, but if you're going to be a poor sport, you're not going to get a gotcha. I learned that if I use the game with future classes, I will have to explain ahead of time that we need to build up our teammates, not put them down. After your students are successful with one behavior goal, you can always switch it to something else. It could be lining up quietly, walking through the halls appropriately, listening on the carpet, working quietly during independent time... basically whatever your kiddos are struggling with could be your Good Behavior Game goal. I think switching it up will keep the kiddos motivated to keep up their good behavior. I know I'm only three days in, but I'm so happy with the success we've had so far!